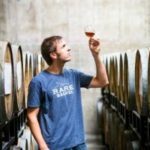 The Rare Barrel is an all-sour beer company. Sour beer is their favorite style of beer. The flavors produced by this unique fermentation and aging process cannot be replicated in any other food or beverage. Due to the involved process, sour beer is not often a commonly brewed style, making it difficult to find. We’d like to help change that. Aside from their personal preferences for the beer, there are also practical reasons for going all-sour. By focusing completely on sour beer, they can concentrate on learning as much as possible about the reasons why those unique flavors are produced in sours. With their entire focus on sours, they have crafted a cellar around the production of sour beer. Their space is dedicated to the conditioning of barrel-aged sour beers. With high ceilings, a moderate climate and plenty of space, they give their barrels an ideal home to create their unique flavors. It’s been said that constraint breeds creativity. By adopting a singular focus on crafting sour beer, they plan on thoroughly exploring flavors through both conventional and experimental methods to create exciting new beers. We’ve been working with Pablo and Treefrog Digital on a regular basis since early 2015, and have really enjoyed this partnership. Of the many projects we’ve worked with them on, the most impressive was creating custom software that has allowed us to streamline our order fulfillment process for both our shipping orders and in-person pickup orders, which has saved us and our customers a significant amount of time and made our lives a lot easier. This was a big project for us and I was admittedly a little nervous to start such a big custom project, but Pablo delivered and my only regret is that we didn’t start working on it with them sooner. Treefrog Digital has also been amazing at improving the user experience on the front end of our website… which we also would have started sooner if we’d known they were so good. From our experience, Treefrog Digital consistently delivers on their projects, often completes projects before the due date, and are just great to work with. My main complaint is that they don’t live close enough for us to take them out for beers. We have worked with The Rare Barrel in several projects that had involved front-end and back-end development, third party integrations, app development and building custom software solutions from the ground up. We created a custom software that has allowed them to streamline their order fulfillment process for both shipping orders and in-person pickup orders, which has saved them and their customers a significant amount of time making their lives a lot easier. As part of this project we also generated a custom native iOS mobile app to scan QR codes from clients membership cards to find if they had waiting orders at the brewery for them to pickup. This system integrates with Wine Direct E-Commerce (previously known as Vin65) platform web services and Golden State Overnight Delivery Services (GSO) API.